Baron Léon Lambert, Brussels (by 1970); sale, Christie's, London, 29 June 1987, lot 61. U. Apollonio, Marino Marini: Sculptor, Milan, 1958, p. 94 (another cast illustrated). E. Trier and H. Lederer, Marino Marini, Neuchâtel, 1961, pp. 66-67 (another cast illustrated). H. Read, P. Waldberg and G. di San Lazzaro, Marino Marini: Complete Works, New York, 1970, p. 363, no. 267 (another cast illustrated, p. 204). C. Pirovano, ed., Marino Marini scultore, Milan, 1973, no. 273 (another cast illustrated). A. Szinyei Merse, Marini, Budapest, 1977, no. 25 (another cast illustrated). G. Carandente, intro., Marino Marini: Catalogue Raisonné of the Sculptures, Milan, 1998, p. 239, no. 338b (another cast illustrated). Piccolo cavaliere, which depicts a horseman on the brink of falling from his steed, demonstrates the way that Marini transformed the timeless, venerable theme of the horse and rider to express the tension and discord of the modern era. His first forays into equestrian sculpture, which would become the central and most enduring motif in his oeuvre, date to the second half of the 1930s. These early statues show the rider steady and balanced on the back of the horse, recalling the traditional triumphant stance of the warrior on horseback (see e.g. Beretta, no. 122; sold Christie's London, 4 February 2009, lot 33). In the wake of the Second World War, however, Marini ruptured this classical equilibrium and began to depict the rider as increasingly imperiled on his mount; the monumental solidity that characterized his earlier works is replaced by a sense of climax and crisis. In the present example, the rider's body is flung back dramatically, his truncated limbs flailing in an effort to stop his inevitable fall. The horse's legs are splayed widely, as if the animal had recently come to an abrupt halt. Its neck and head stretch straight up toward the sky in a posture of keening and anguish, recalling the felled horse in Picasso's Guernica, a key influence on Marini's imagery in the post-war period. Marini's own statements make clear the contemporary significance that he accorded his equestrian sculptures. In 1972, the artist observed, "My equestrian statues express the torment caused by the events of this century. The restlessness of my horse grows with each new work, the rider appears increasingly worn out, he has lost his dominance over the beast and the catastrophes to which he succumbs are similar to those which destroyed Sodom and Pompeii" (quoted in N. Beretta, op. cit., p. 14). Even more boldly, he declared, "Personally, I no longer have the intention of celebrating the victory of a hero. I would like to express something tragic, almost the twilight of humanity, a defeat rather than a victory. If you consider, one after another, my statues you will notice that each time the rider becomes less capable of mastering his horse and the animal becomes increasingly intractable and wilder instead of yielding. Quite seriously, I believe that we are approaching the end of the world" (quoted in P. Waldberg and H. Read, op. cit., p. 491). The image of the rider falling from his mount also signified for Marini the rupture of the symbiotic union between man and nature, which was rendered obsolete by modern technology (specifically, by the substitution of the machine for equine labor). The artist explained, "The whole history of humanity and nature lies in the figure of horse and rider in every period. In the beginning there was a 'harmony' between them, but in the end, in contrast to this unity, the violent world of the machine arrives" (quoted in G. and G. Guastalla, eds., Marino Marini, Pistoia, 1979, pp. 29-30). In the present sculpture, this rupture is embodied by the bold contrast between the sturdy, earthbound horse, its feet planted at each corner of the work's base, and the fragile rider, dramatically suspended in mid-air. 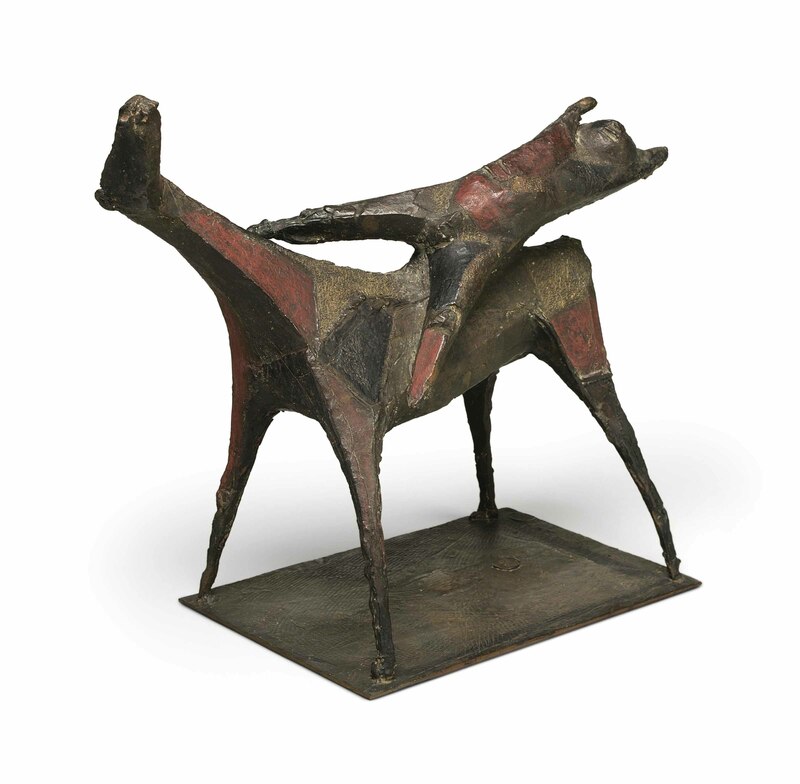 In contrast to Marini's earlier equestrian sculptures, which employ the reduced, rounded forms reminiscent of Etruscan statuary that the artist is known to have admired, the works from the early 1950s are increasingly angular and architectonic, reflecting the growing presence of a brutal, machine-dominated world. The casting process did not mark the end of Marini's relationship with his sculptures: once cast, he kept working on them, chiseling, corroding and sometimes painting the bronze, treating the surface as a painter would the canvas. Piccolo cavaliere is a remarkable and rare example of such practice. It shows Marini's modern contribution to the techniques of bronze sculpture, testing the expressive potential of the medium. The surface of the present Piccolo cavaliere conveys as much tension, struggle and drama as its subject-matter. The horse's skin has been hand chiseled with golden lines of cross hatching incised into the surface. Patches on both the horse and rider have been painted red, which when viewed together with the chiseling recall the patterns of the harlequins of Picasso's paintings and drawings.